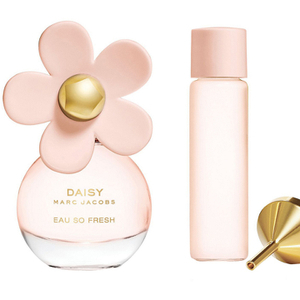 A fruity floral fragrance, Marc Jacobs Daisy Eau So Fresh Purse Spray captures the vintage flavour of Marc Jacobs' feminine, edgy designs. Juicy top notes of crisp Raspberry, Grapefruit and Pear and joined by sensuous heart notes of Wild Rose and Apple Blossom, on a warm Plum and Cedarwood base. The purse spray is the perfect size for fitting in your handbag for a freshening spritz on the go. – E.W.